The Italian Cabinet Galleries contain paintings and precious objects like those that would have been in the small private chambers or studies (studioli) of an Italian Renaissance prince, humanist, or well-to-do merchant. In such rooms, collectors expressed their individual taste and interests through the rare and beautiful objects they chose to display. A studiolo generally held objects that were small and finely detailed, meant to be handled and admired at close range: paintings and bronzes, carved gems, coins and medals, rock crystal vessels, gilt and silver clocks, small arms, ivory carvings, and brightly painted maiolica dishes. Many of these objects reflected the Renaissance fascination with classical Greece and Rome. Collectors sought out rare antiquities and commissioned works from modern artists that incorporated heroes and motifs from the ancient world. The objects in these galleries also reflect the international influences at work in Renaissance Europe, for example the spread of Italian taste for ornamentation and the antique to the court in France, and the incorporation of styles from the Near and Far East in Italian bronze and ceramic vessels. In 1487, the sultan of Mamluk Egypt sent a gift to Lorenzo de’ Medici of exotic animals and “large vessels of porcelain, the like of which has never been seen.” By the mid 1500s, the Medici family’s porcelains, most from China, numbered in the hundreds. 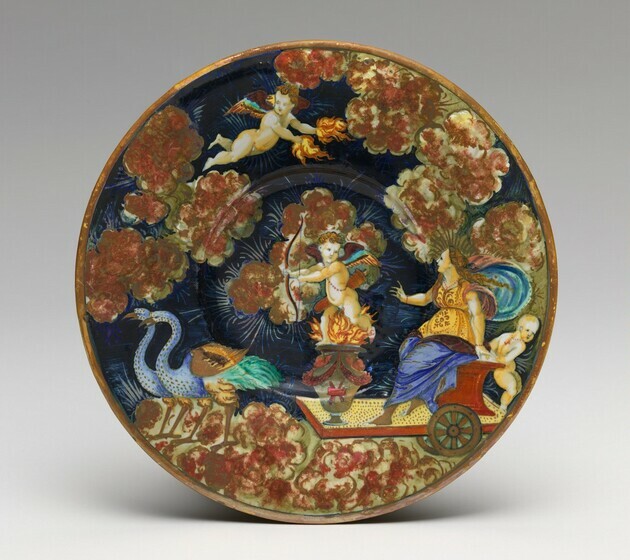 Italian potters were able to create a soft-paste imitation of porcelain, and in 1574 Francesco de’ Medici established two ceramic workshops in Florence to produce these wares. 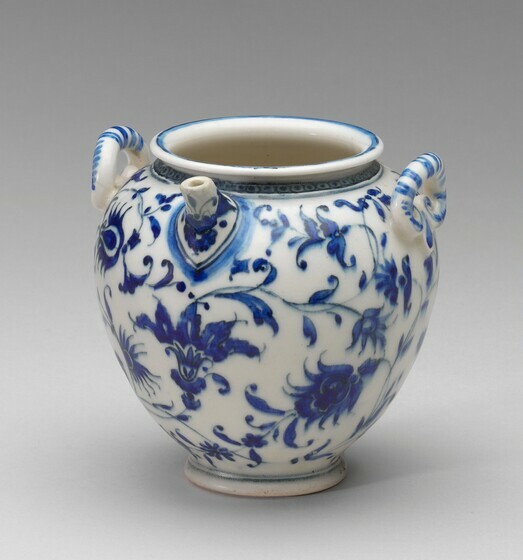 Today, some seventy examples of Medici porcelains are known, including this flask, possibly used for oil. Potters in several Italian cities, including Urbino, Deruta, and Gubbio, specialized in brilliantly colored tin-glazed earthenware, a luxury ceramic often embellished with metallic luster glazes. Some depicted portraits or family crests, but many were decorated with elaborate narrative scenes from the Bible or ancient mythology. These wares are known as maiolica, probably because the techniques for making them entered Italy from Spain by way of Majorca. 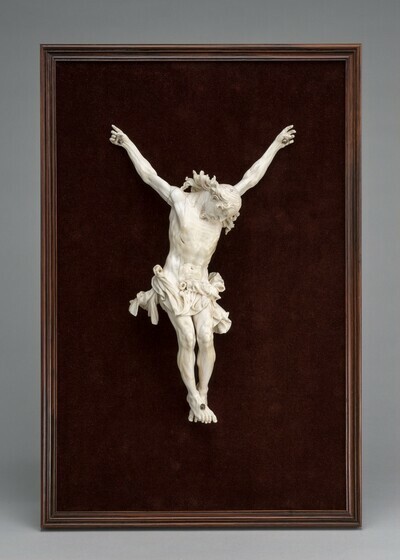 Possibly from Germany, this carved ivory figure of Christ would originally have been part of a crucifix. Its exquisite carving reflects the quality sought in objects for a studiolo, to be held and admired. 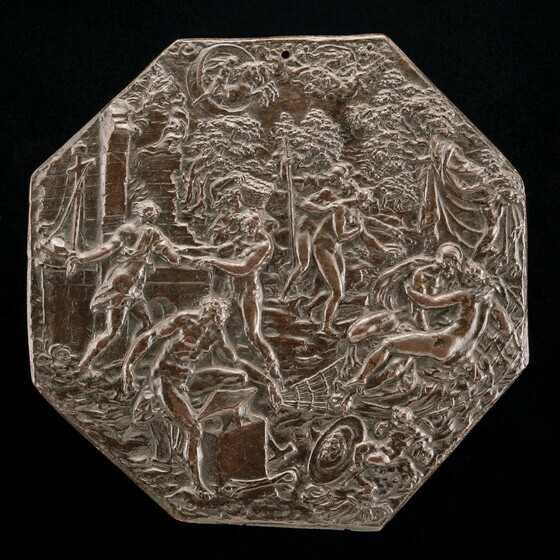 Plaquettes were meant to be enjoyed for intellectual and tactile pleasures. It is easy to imagine owners and their guests passing them to each other and discussing the interpretation of the scenes depicted. Often, as in this example, the subjects were from classical mythology. 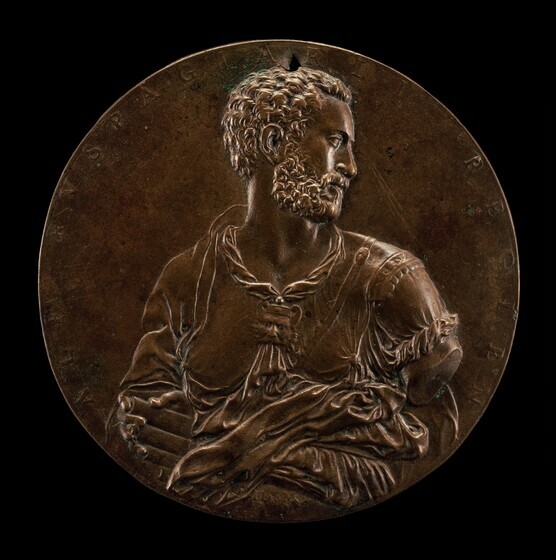 Portrait medals were inspired by the ancient world, in particular the Roman coins that many humanists avidly collected. In his medal Alfonso Ruspagiari refers to himself four times: with a self-portrait; with his name around the edge; with his initials under the bust; and with the Latin word idem, meaning “the same.” Ruspagiari’s medal is one-sided, but the reverse of most medals had a personal emblem or a scene with some meaning for the subject. Not all paintings in a Renaissance study would have been seen on the wall; even the greatest artists were called on to decorate everyday objects. In all probability this small panel was originally part of a box or cabinet. Under the bushy plant near the center is a keyhole, now filled and overpainted but visible in x-radiographs. 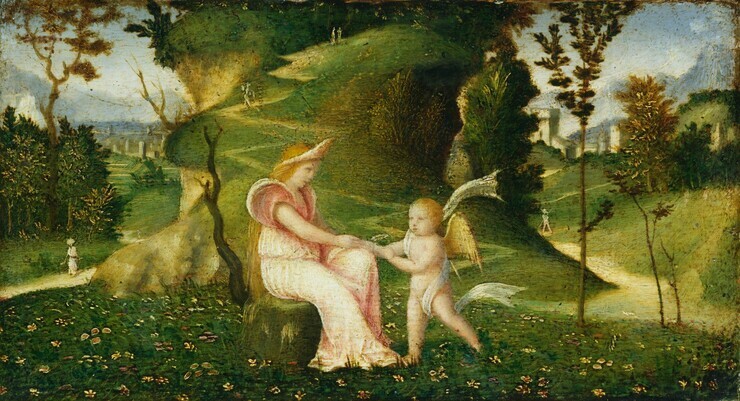 Seated in a lyrical landscape, Venus, goddess of love, seems to be exchanging something—exactly what is no longer clear—with her son Cupid. Perhaps the scene illustrated some episode from an ancient myth—or perhaps the only “subject” is its poetic mood.